I don’t know about the rest of you agility neophytes, but I’m out of my comfort zone just learning footwork to help my dogs through the agility sequences in class. Front cross. Rear cross. Blind cross. Rotate. ‘Push’ the dog. ‘Pull’ the dog. Trying to get the fancy footwork right reminds me of my failed attempt years ago with Apso fanciers in Minnesota. We were at a country-western bar learning line dancing. Don’t ask me why we were at a country-western bar! Not my cup of tea! Every time the line turned, I was facing the wrong way. 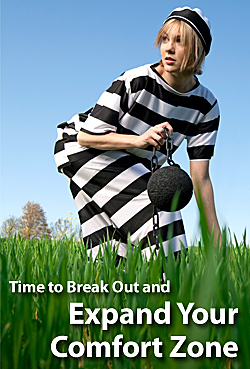 Read Time to Break Out and Expand Your Comfort Zone.